Site of the fatal January 4, 2019 head-on crash on the Trans-Canada Highway west of Field, B.C. One woman is dead and another was transported to the Foothills Medical Centre in serious condition following an early Friday morning crash west of the B.C.- Alberta boundary. 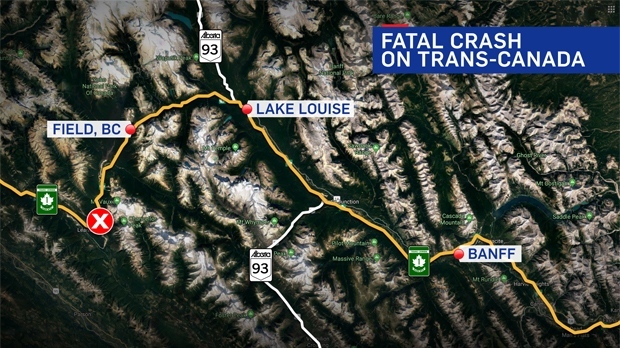 According to British Columbia RCMP, a semi-tractor trailer and a passenger vehicle collided on the Trans-Canada Highway at a location approximately 20 kilometres west of Field, B.C. at around 1:00 a.m. The passenger vehicle was travelling eastbound when it entered a westbound lane and was struck by an oncoming transport truck. A 20-year-old woman who had been a passenger was pronounced dead at the scene. A woman, believed to be in her early 20’s and who had been driving, was transported to the Foothills Medical Centre in Calgary by ground ambulance in serious but non-life threatening condition with undisclosed injuries. The driver of the transport truck was not seriously injured. RCMP have not released the identity of the deceased but sources confirm to CTV that she was from Airdrie. A section of the Trans-Canada Highway between Field and Golden was closed for more than six hours following the fatal crash. RCMP continue to investigate the fatal collision. Highway conditions in the area were conisdered poor at the time.